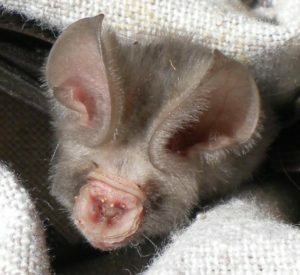 Sundevall’s round leaf bat. By Ursula Franke – Own work, CC BY-SA 3.0. Hi everyone! I hope you had a good week! I had a pretty good one because I have been looking forward to going camping. That’s right! I am going camping tonight! And then tomorrow, I am going caving. I’ve never been caving, so I hope it’s a lot of fun. This week has been a hard one for a lot of people around the world. People in Puerto Rico are still without power. There were several major earthquakes around the world. Some really bad ones were in Chile and at the border between Iran and Iraq. In addition to all that, there has been a political crisis in Zimbabwe. My thoughts are with everyone affected by these difficult situations. My family has recently become friends with some people in Zimbabwe. We have heard from one friend who said that people in his area are doing well, but we haven’t heard from our friend in Harare. We are worried about her and hope everyone there is ok. In her honor, I thought it would be nice to research bats from Zimbabwe. They have a lot of really cute ones. I decided the cutest one is the Sundevall’s Roundleaf Bat. I think this little bat looks like a little piggy. They have long gray or bright orange fur with brown wings. They also have big round ears and a horseshoe-shaped nose that reminds me of my pug. These bats are common throughout much of Africa. Their diet consists of mostly moths, but they also eat beetles, flies, and other insects. The Sundevall’s Roundleaf Bat likes to roost in caves, tree hollows, mines, and attics. Some of their cave roosts are really big. One cave in Gabon has 500,000 of these bats. If you would like to read more about these adorable little bats, you can find information here. Previous StoryA beautiful, superheroic city! Nice post. I hope your friend is ok.